Over the past few years, rising internet penetration in the country and proliferation of personal computing and mobile devices propelled the antivirus solutions' demand drastically. Changing threat landscape urged the organizations to increase their security budgets and invest heavily on antivirus solutions. FDI equity inflows in IT hardware and software (for R&D, expansion of existing production facilities, building new facilities, mergers & acquisitions, etc.) has increased in last few years. Additionally, the overall antivirus market in India further recorded growth in awareness towards paid antivirus solutions among the individual segment. According to 6Wresearch, India Antivirus software market size is projected to reach INR 14,782 crore by 2024. Antivirus market in India is expected to register healthy growth moving forward. Government initiatives, proliferation of mobile devices, rising internet penetration and IoT sector, substantial increase of cyber security spending and emerging IT, SME and educational hubs in the country are some of the key factors to drive the growth of antivirus market in India. Expenditure on cyber security in India is forecast to reach INR 226 thousand crore by 2025. 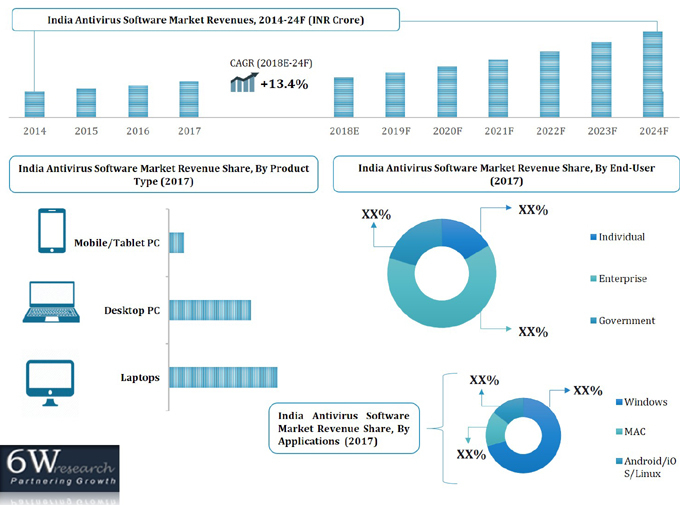 Enterprise would remain as the key growth segment for antivirus market vendors in India, however, rising awareness among the individuals for the paid antivirus solutions and growing demand for smartphone devices would open-up potential opportunities for market vendors in the individual segment. On the other hand, government segment is likely to post a much higher growth with Digital India plans on hand leading to higher spending on IT sector. Smartphone and tablet PC segment is expected to exhibit highest growth among other devices. Android is likely to lead the segment amongst the applications. However, in the overall applications, Windows segment would account for maximum revenue share in the overall India Antivirus software market share in the coming years. The India Antivirus Software Market report thoroughly covers the market by end-user, by applications, product-type, sales channel, regions and Tier cities. The India Antivirus Software Market outlook report provides an unbiased and detailed analysis of the India Antivirus Software Market trends, opportunities/high growth areas, market drivers, which would help stakeholders to device and align market strategies according to the current and future market dynamics. 15.1. Quick Heal Technologies Ltd.
15.4. ESET, spol. s r.o. 15.7. BD Software Distribution Pvt Ltd.
15.9. Sophos IT Services Pvt Ltd.